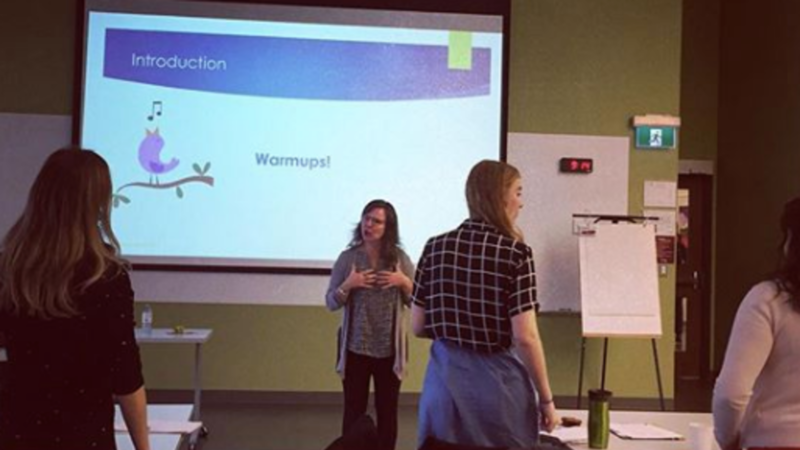 2017 has been an exciting year, as we launched the first workshops through the Ontario Music Therapy Academy. Our last workshop of 2017 was facilitated by Registered Psychotherapist, Credentialed Music Therapist, Kristen Anderson. The workshop focused on participants exploring the 'voice in practice'. The workshop began with warming up our vocal cords by sighing, yawning, and humming. We utilized humming as a way to find our tonal centre and to stimulate the vagus nerve in order to increase vagal tone - concepts we enjoyed touching upon throughout the workshop. Later in the workshop, Kristen lead us through the various expressions of our voice and how they can represent as defence mechanisms and how to identify these defences in our clients in a therapeutic setting. The workshop concluded with experiential learning where participants engaged in an example of Dr. Diane's Vocal Psychotherapy techniques. The example showed how through the Vocal Psychotherapy training, one could use these techniques to allow their clients to explore their emotion through voice, and the various techniques the therapist can use on the piano and their voice to support their client. Kristen also left us with great book reccomendations, some of which are pictured to the right. As we begin the new year, we anticipate great learning ahead from our variety of workshop topics and presenters. In January and February you can look forward to a workshop entitled 'Music & Neurosicence: New Approaches in Neurorehabilitation' by Brian Harris, and 'Hand ON! Ears On! Guitar workshop', facilitated by Brian Katz. The OMTA looks forward to providing professional development opportunities that are valuable and result in direct applications for your clinical work. We value your feedback if you have attended a workshop, and if you have not yet attended we value your input into which types of workshops would be beneficial to you! We hope to hear from you in 2018!